I have a thing for skater dresses at the moment! I find them so effortless and flattering. 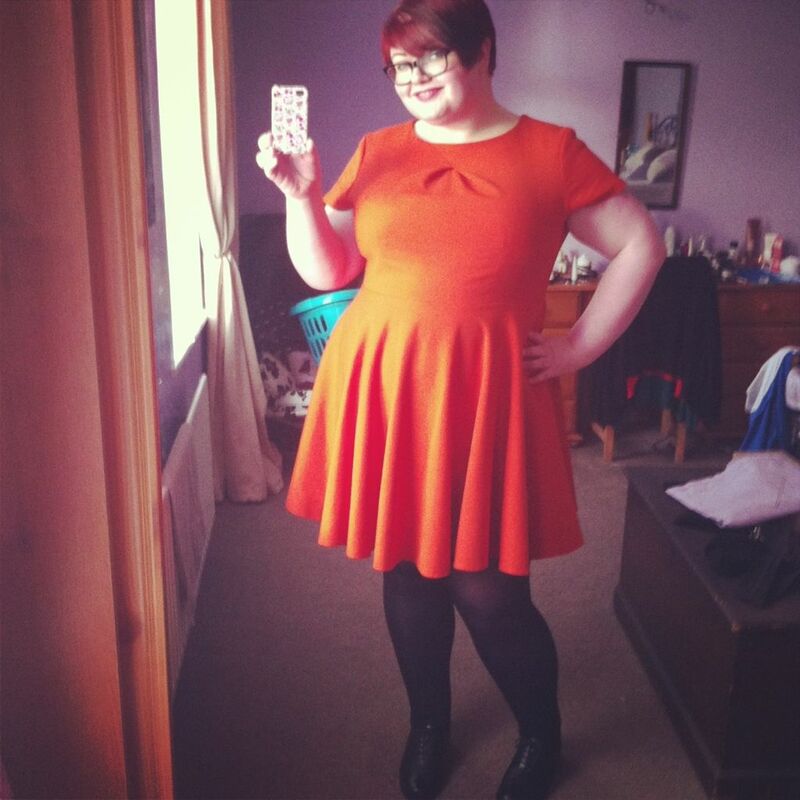 I've recently dug my bright orange, Velma style one out of wardrobe storage and feel like I'm never out of it!! It allows me to go belt free, and also means I can be a little shorter in my dress length as the cut allows for twirly swirly skirts!! So when the lovely team at Ax Paris asked me to review an item, my heart and brain both said YES! to this Bonded Lace dress. I hardly read the description, if I'm honest, I just clicked the link and waited. My first reaction was it was too nice to wear to work. Now, I'd be more than happy to wear this in the office, don't get me wrong, but because I have to wear a lanyard with ID badge attached, I don't want them to click the lovely lace detail. 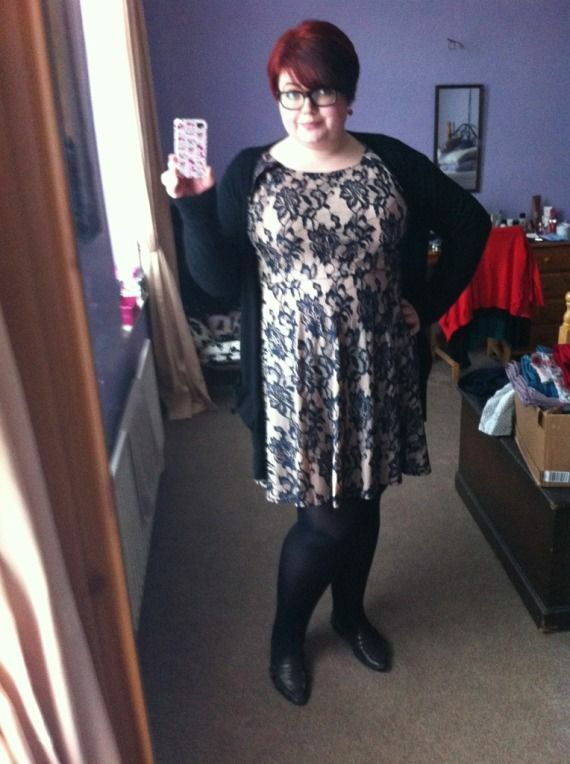 So, whilst I'm not saving this dress for best, I won't be wearing it to the office either. 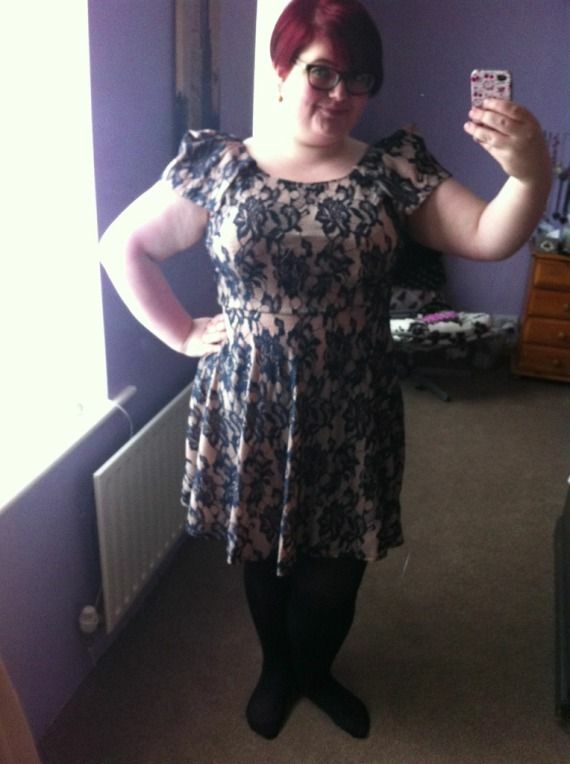 It was a perfect fit in my usual size 20. I opted for my white Satine bra from Bravissimo, which is a little ill fitting, but means I could safely wear this without risking ripping at the seams! The length is a littler shorter than most of my dresses, but I'm slowing starting to welcome showing a little bit of leg!! 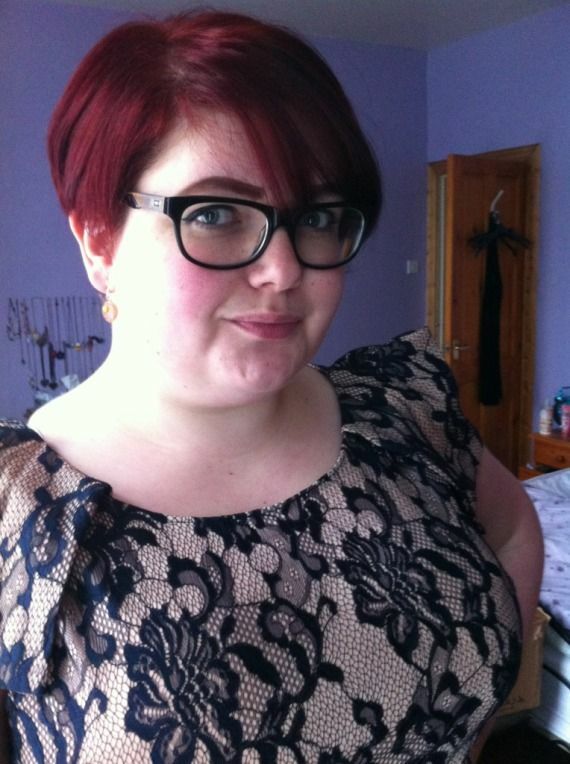 I teamed it with my black boyfriend cardigan, and pointed brogues to go and collect my house guest for the weekend, Rachel, from the train station. 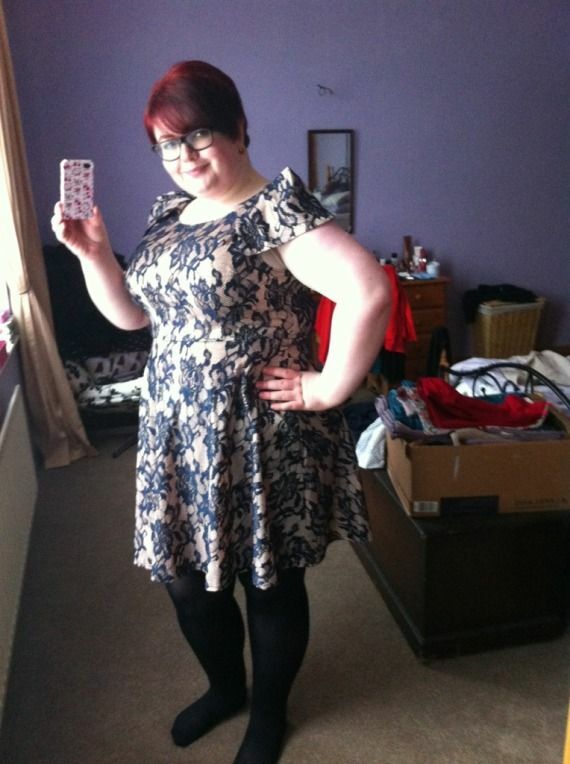 She LOVED the dress, and we both agreed I could have easily worn it on our night out that night. Jewellery and make up wise, I kept it simple - no necklace (again, I didn't want to click the lace), and pale pink lips to give it a more girly look. I did however, think to add some Little Miss Delicious pancake earrings to add something a little bit different to the mix! On reflection, the dress would be perfect for a Christening party, or equally formal event, given the light colour and the quality of the detail. However, I want to get as much wear out of this as possible, so look out on my Instagram for sneaky appearances!! It really suits you! Love the wee cap sleeves and you're right, it's a perfect fit! I had no idea AXParis had a curve collection! This is amazing! And that dress is absolutely stunning, it definitely suits you. Love it, that looks great. 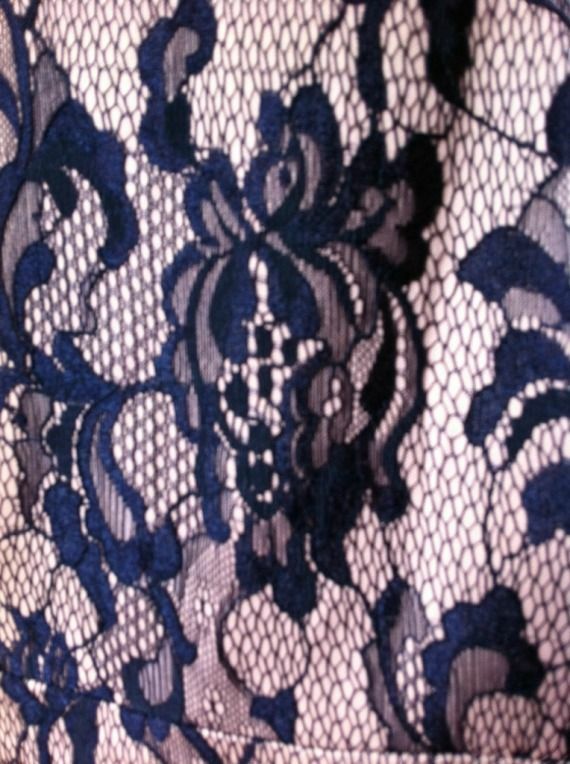 I might get that myself as I love the idea of the navy lace. Love these dresses. They look fab on you! I'm a new follower of your blog. Really like it! What you need to know about choosing cheap flower girl dresses shoes for your baby. Read some practical and economical advices about baby shoes shopping and choosing a good and healthy baby shoes.